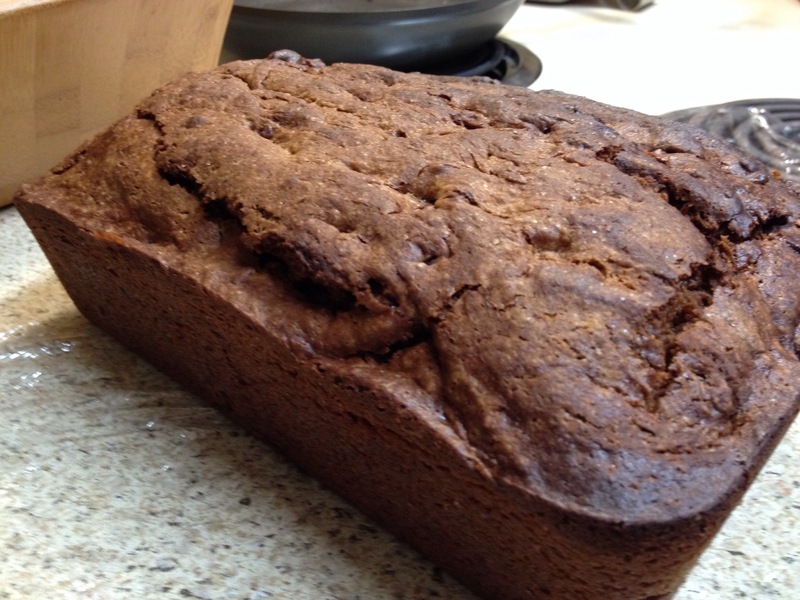 Now I can’t take credit for this one, Food Babe is where I found this recipe and I have the link below. I did change it slightly when I made mine. The original can be found by clicking the link, the way I made mine is listed below. It’s so easy and everyone should try this! 1. Cream all ingredients together leaving 1 portion of chopped chocolate for the topping. 5. 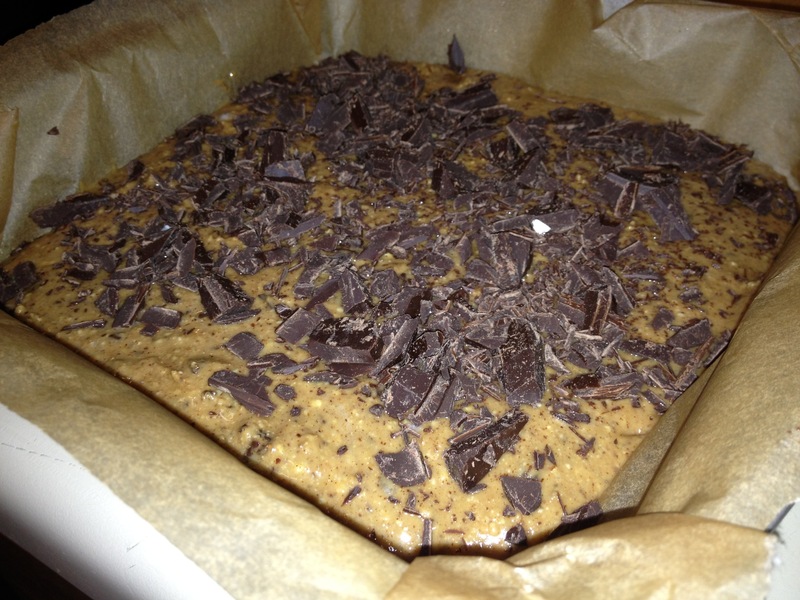 Remove from freezer- Cut into squares and eat! 6. Store left overs in freezer. You have 24 hours (from 6pm CST May 13, 2013) to comment on this post to claim your prize. Please leave an email address to be contacted. Enjoy Life will mail your prize to you directly! For more information on Enjoy Life products click HERE. Check out our upcoming giveaways by clicking HERE! – Freebies! Enjoy Life! And cookies? And Chocolate? Oh Yes! As most of you know, I eat Gluten Free. 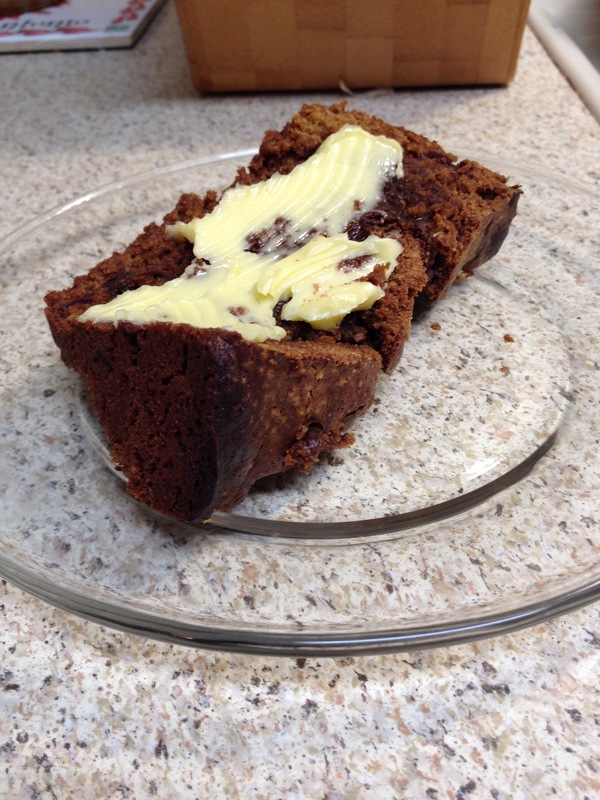 Today I would like to share some amazing gluten, dairy, nut & soy free products! 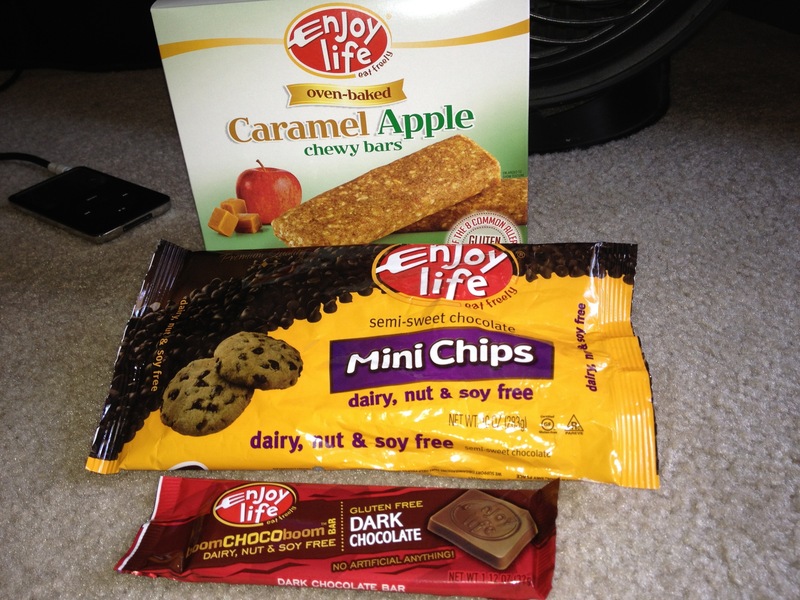 These are made by Enjoy Life, you can visit their website by clicking HERE! 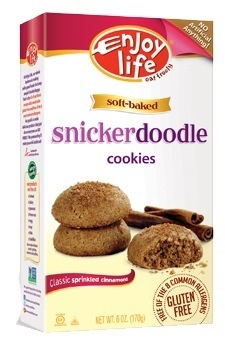 Personally, my favorite product is the soft baked snicker-doodle cookies! These cookies are soft and chewy with just the right mix of cinnamon and sugar to leave you satisfied! They are smaller in size compared to some cookies but this is good for your waistline. Just because these are major allergen free and non GMO does not mean they are “good for you”. So moderation is key! I’m laughing as I type that because when these are in the pantry, they do not last long at all! I also greatly enjoy the chocolate products they make as well! I keep the chocolate chips in my pantry on a regular basis for baking. They are also great to have a small handful when you just “need” chocolate! The chocolate bars are delicious too, I especially enjoy the dark and rice milk crunch bars. This company makes a variety of flavors and products including snack bars, chips made from lentils and more! These products are available online and in stores! I recently purchased a box of my favorite snicker doodle cookies and discovered to my surprise that one was missing! During production, one had been left out. I emailed the company and a sweet lady named Beth responded with an apology and coupons. I was greatly impressed with the customer service I received. I contacted Beth again this week and she has agreed to give 3 of my followers a FREE Enjoy Life product!!!! You must comment below and be a follower of Jacks Crunchy Mama to enter. The drawing will be held Monday, May 13th and announced at 6:00pm CST.